In part 1 and part 2 Axel went from Loth-rat to Ghost crew member. 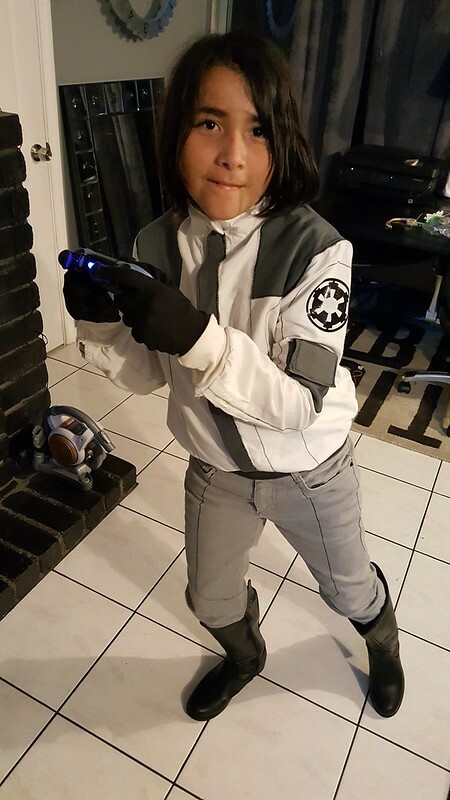 But one problem with costumes for younglings is they outgrow them pretty fast. So while we hadn’t finished his season 3 Ezra yet we had already started on his Imperial Cadet disguise for Ezra! Since that was a lot further along we decided to finish it up! 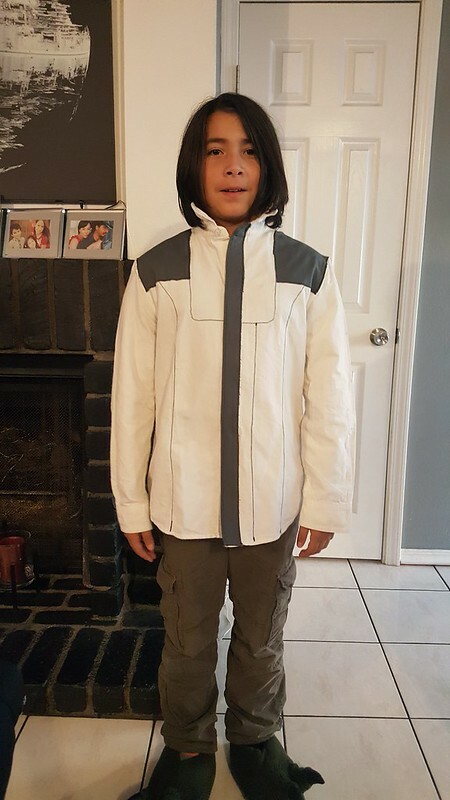 Since we were doing this costume AFTER the episodes were released collecting references was much easier! …. Also those StarWars.com episode guides have LOTS of useful stuffs. Axel was very excited to do this costume becuase he thought it would be a great opportunity to hang with our 501st buddies! I got together my list and set to work. I was a little more confident in my sewing skills as far as the details of this costume went so I decided to trust myself and go for it! I already had an extra pair of my go to driving gloves that I’ve used for everything from Kanan to Stormtrooper to Imperial Knight. As for the pants I ended up finding a nice cheap but comfy pair from a cheap store. This was after I had to throw out the first pair that I found for him wayyyyy back during season 1 when he asked about the costume. Turns out you need to commit to kids costumes quick or your materials will be outgrown if you wait too long! I found a nice white button up work shirt from a thrift store. I’ve seen this costume done with a kind of track jacket for the top but in my opinion, I wanted it to be very reminiscent of our worlds military schools, with a bit more functionality and formal style. I also grabbed some dark grey fabric for the details on the top. Found a nice $25 pair of boots from Shoe City again and that was pretty much it! Axel really wants the helmet but I was unable to find one we could afford so unfortunately he was going to have to wait. I do hope to get around to getting one eventually. … and it was good warm up for the shirt. This would be the most difficult but also would sell the costume if I could pull it off! Our little guy needed it right so I couldn’t blow his cover! 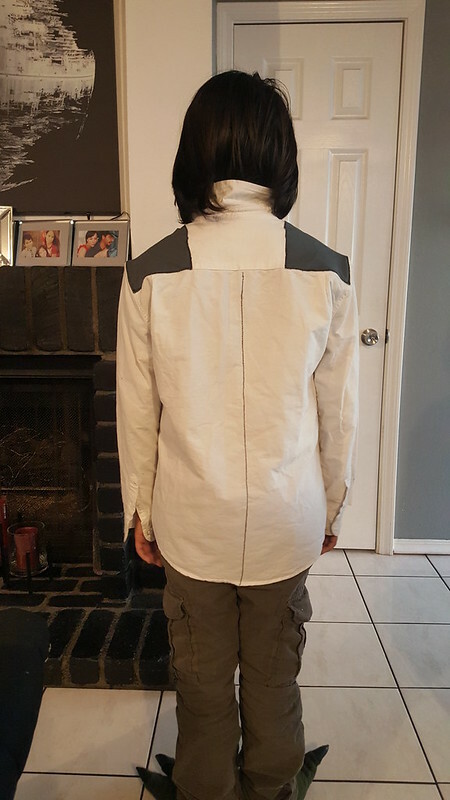 I had to alter the collar, sew in the dark grey panels and pockets, sew in the lines, and add the Imperial cog on the left shoulder. 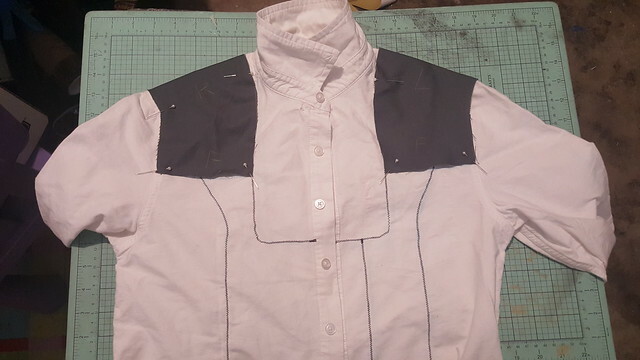 First I sewed the lines into the shirt. Carefully measured and chalked in. It worked!! Then I started with the panels. Little by little I patterned the pieces and pinned em up. Sewed em in and had Axel test fit his new shirt. I had everything ready except for the finishing touch. I acquired a perfect vinyl black cog from Pilot Bay and ironed it on and the shirt was ready. The gloves, belt, and boots were ready to go so the hard part was done! Say Hello to Dev Morgan! Axel tossed it all on together and was ready to go undercover with those Imperials! Axel loved how comfy this costume was! Getting that intel from the Imps was going to be a piece of cake now!